"Formed in 1975 in Birmingham, Steel Pulse is one of Britain's greatest reggae bands, in terms of creative and commercial success. Steel Pulse started out playing authentic roots reggae with touches of jazz and Latin music, and earned a substantial audience worldwide. Their 1978 debut, Handsworth Revolution, is still regarded by many critics as a landmark and a high point of British reggae. 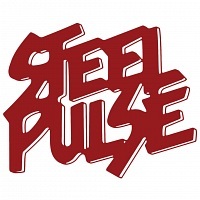 By the late '80s, Steel Pulse had won a Grammy and were working full-fledged crossover territory. They subsequently returned to a tough-minded, rootsy sound and have added touches of dancehall and hip-hop along the way." Founder member, drummer Steve "Grizzly" Nisbett died in 2018.